It seemed to have something for everyone: a fun ferry ride to get there, nice restaurants by a busy harbour, beautiful and easy coastal paths, or more difficult hiking trails leading to incredible views. The rest of the family gamely went along with my plan, not knowing much more than my word that it sounded great. We were not disappointed. 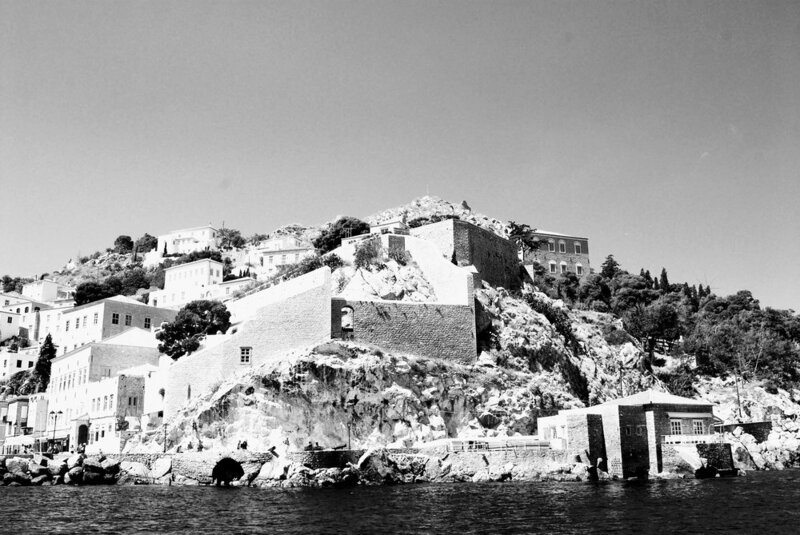 The old bastions guarding Hydra port. The ferry ride to Hydra was beautiful. Many circa 1800 houses are still around. Reason #1- There is truly no motorized transport on the island other than a trash truck-not even bicycles. Everything is moved by pedestrian or equine power. As we were pulling into the harbor on the ferry, I noticed a mule carrying a mini fridge up one of the coastal paths. I guess all appliances must be within mule- approved size limits before being shipped to the island. Reason #2- As a Greek National monument, any new construction on the island must adhere to the predominant 1800 style of houses, which means there are no large resorts on the island, which truly does make it unlike any other Greek island I have visited. That doesn’t mean there aren’t lots of tourists though. Cruise boats on day-long island tours disgorge hundreds throughout the day, but they only get a few hours to explore the Hydra port. And once night falls, the island gets a new vibe as it is left to those who live there, either permanently or just for the night. Reason #3- You'll find walking trails all over this island since this is the only way to get around. The fairly flat coastal paths lead from Hydra port to Mandraki to the east and Kamini, Vlychos, and Vlychos Plakes to the west. All of these villages have beaches, tavernas by the water, and make excellent stops on a walking tour of the coast. Or if you have some quad power, you can go up. 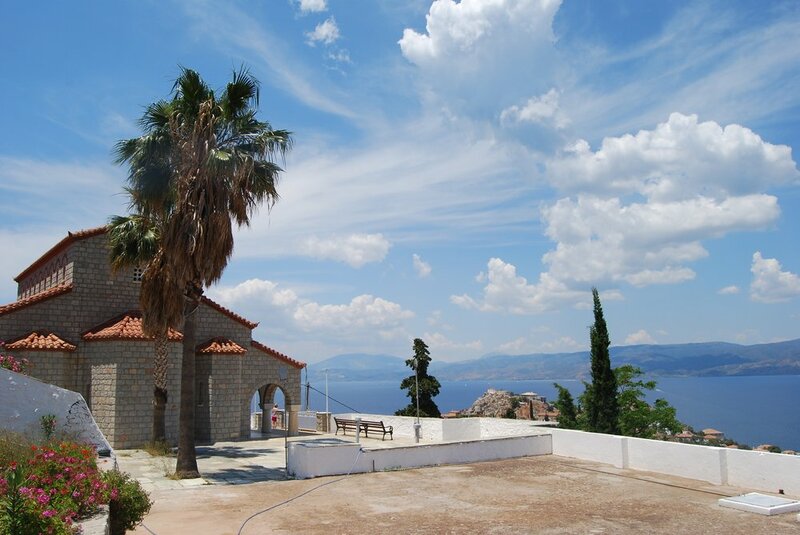 The hike to the Monastery of Profits Ilias is the most popular destination but it is a not a stroll. If you have younger kids, the half- mile hike to Agios Konstatinou might be a better option. Not quite the same views but still pretty breath-taking and without the whining about all the stairs. If you have some distance hikers in the group, you'll find more trails to the east and west ends of the island as well. * A caveat- There is not a lot of tree cover, nor any natural water sources on Hydra. If you are here in the summer, you should start very early in the day as it gets extremely hot. You need to take lots of water with you on your hikes any time of the year. Coastal walk to Vlychos. This is a gorgeous and easy walk. 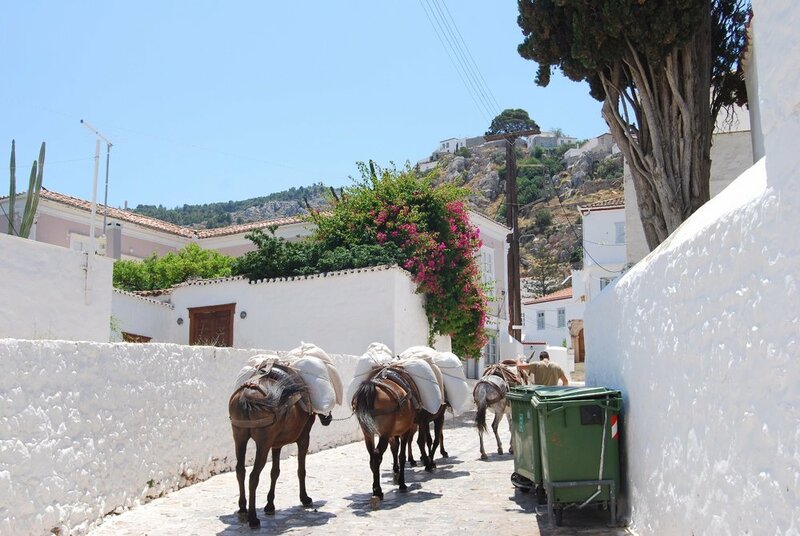 If you like hiking uphill, there are lots of options on Hydra. Part of the hike to Profits Ilias. The only part that is shady and flat. Hydra was one of our favorite stops while we were in the Peloponnese, and you should definitely make it yours as well if you can. You won't regret a trip to this car- free oasis. Thinking about traveling to Greece but no idea what to do and too busy to read a million blogs and guidebooks to figure it out? We've got you covered. My Hydra itinerary spells out everything you need to know for 2 days on this fantastic island- Where to stay, eat, and play. It lists in detail various hikes you can take on the island from 1 mile strolls to all- day hikes. It also tells about the various beaches, including the ones only accessible by boat, and how to get there easily.